MSE Creative Consulting Blog: No, Mr. Gore, Missouri is Not in a "Drought Emergency"
No, Mr. Gore, Missouri is Not in a "Drought Emergency"
Mr. Gore was on Fox News Sunday and told us that Missouri declared a "drought emergency two days ago." 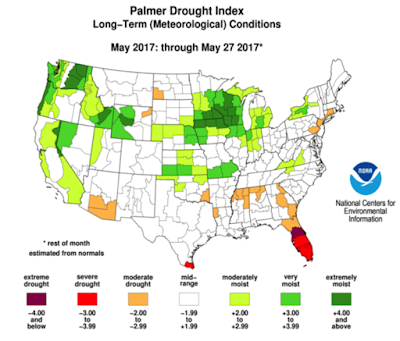 Here is the latest Palmer Drought Index. There is no drought in Missouri. Most of what Mr. Gore said about weather in the United States was wrong. The emergency in Missouri is for funding for flood damage. The floods were in May.